First-class CaseCruzer carry-on Pelican laptop case provides both peace of mind and style for professionals whose genius takes flight in a MacBook. When traveling designers and editors use a laptop case, they aren't worried about protecting their MacBook or laptop. Their greatest fear is losing the sophisticated graphics and videos contained inside. That's why they choose the stylish new Pelican case by CaseCruzer when traveling long distances or between home and office. This laptop case is also ideal for airline travel. Premier safety latches tightly secure your laptop. And the small handle on the top of this carry-on luggage makes it easy to maneuver into an aircraft's overhead bin - a significant advantage now that airlines charge a fee for each checked bag. The convenience allows business travelers to access and work on their Apple MacBook Pro laptops while on the way to important meetings. The suave, sophisticated case also enjoys the renowned, standard Pelican features: it is indestructible, watertight, airtight - no need to worry about dusty, sandy or gritty environments - extremely buoyant, and as if that weren't enough, it comes with an unconditional lifetime guarantee. Its specifications also meet U.S. military standards and the carry-on case. 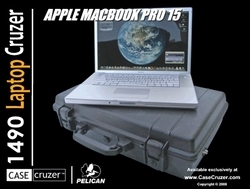 For more information to protect your MacBook with the new Pelican laptop case, visit http://www.casesbypelican.com. More information by phone is available at 800-882-4730 in the U.S. or 909-613-1999 internationally and by fax 909-465-5598. Or write to CaseCruzer at 4665 State Street, Montclair, CA 91763.